Large storage capacity modular drawer cabinet with 3” deep drawers to fit all your storage needs. 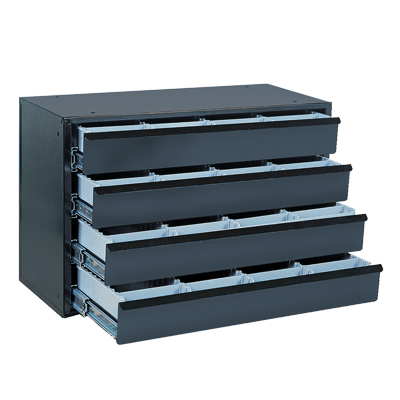 Each drawer is equipped with heavy duty ball bearing slides for a smooth quiet slide. Drawers extend fully and have a storage capacity of 100 pounds each. Each drawer includes a polystyrene 3” deep insert with 12 adjustable dividers which enables you to customize each drawer or simply remove the insert for storage of tools or larger items. Each divider has a lip label area to note contents or bar code label. Each drawer has a steel full width angled drawer pull. Top threaded mounting holes to stack with other cabinets and side holes for ganging. Cabinet measures 20.5”W x 12.5”D x 15”H. Black textured powder coat finish. Features (4) 3” deep drawers. Ships fully assembled.